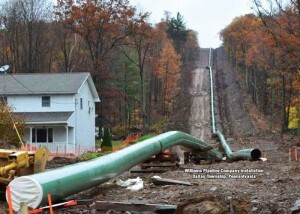 NHPipelineAwareness.org strongly opposes construction of the Northeast Energy Direct natural gas pipeline (NED) that Kinder Morgan/Tennessee Gas Pipeline seeks to build in New England, New York, and Pennsylvania. Construction of this pipeline would violate our rights as stewards of the land we live on through the taking of that land by eminent domain or other coercion. It would also ravage our communities, expose us to danger of serious accidents, and devalue our property. Common sense dictates that a project as massive, disruptive, and costly as NED should proceed only if it is clearly shown to be the best way to meet the public objective. Yet the pipeline’s advocates rush to tear up our landscape with little consideration of alternatives such as conservation, improved efficiency, and expanded use of renewable energy sources. For too long, decisions related to energy have been controlled by corporations and individuals motivated by financial and political interests rather than by the public good. This project is more of the same. The prospective benefit to the fossil fuel industry is clear, but the alleged public need has not been demonstrated. Developing a sustainable, environmentally responsible energy policy is among the most important challenges the world faces. Increased burning of natural gas and other fossil fuels is neither sustainable nor responsible. Not only would a drastic expansion of natural gas infrastructure be harmful in its own right, but it would also be a barrier to implementing existing technologies for renewable energy and developing new ones. Increasing reliance on natural gas isn’t progress, it’s self-destruction. Climate change is rapidly occurring and is a major threat to our way of life. Methane—which is what natural gas is—is a far more potent greenhouse gas than carbon dioxide, and it leaks into the atmosphere in great quantities at every stage from the drilling site to the final destination. We demand that energy policy be based on sound science and economics and the public good, not on corporate profits.